I. 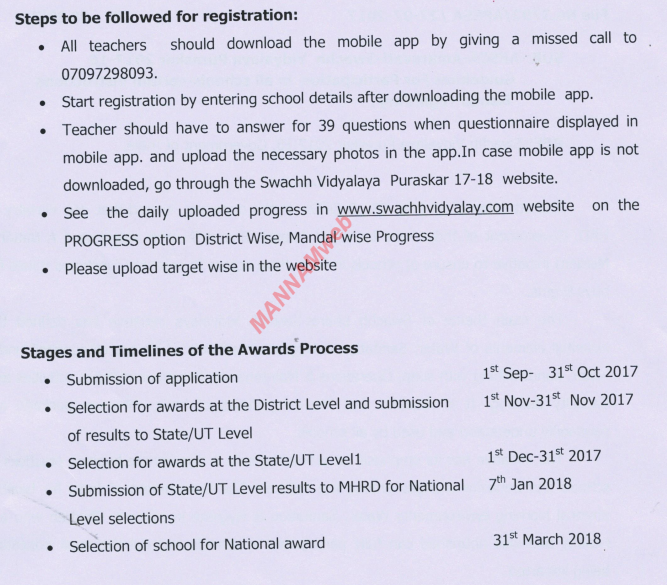 Schools will register and submit information as per the prescribed format (Annexure 1) made available online (→Swachh Vidyalaya http://mhrd.gov.in→Swachh Vidyalaya Puraskar 2017-18) or by downloading a mobile app, Swachh Vidyalaya Puraskar 2017 - 18. The mobile app can be downloaded from Google Play Store or apple istore. The registration of schools would be done with the U-DISE code of the school. II. The website/mobile app was customized to cater to different categories of schools. IV. The information in the format corresponds to the requirements in Swachh Vidyalaya guidelines. Annexure 2 provides the list of indicators categorised under (a)Water (b) Toilets (c) Handwashing with Soap (d) Operations and Maintenance and (e) Behavior Change and Capacity building. VI. The performance of the schools against categories will be scored as per the method given in Annexure 3. * Each school should score a minimum of Two Star ra ng in each of the Sub-categories in order to be eligible for any award. Online (web/ mobile) applications received before the cut-off date will be screened by a District level Committee headed by the District Collector (or her/his appointee) and comprising of District Education officer, three eminent school teachers, Superintendent Engineer (Water supply / PHD), District Health Officer and two members fromcivil society organiza ons/NGOs. • The district level committeemay get a physical verifica on of the nominated schools done by a team consisting of school teachers and students in the district. The verifica on would be done using a check list and by taking photographs. • Each of the selected schools with highest overall score (Total 8) and each of the schools having the highest score under each sub-category (Total 40) will be awarded with certificate of recognition at district level, provided that all the schools with an overall ra ng of Five Starwould be awarded with a certificate of Recognition. 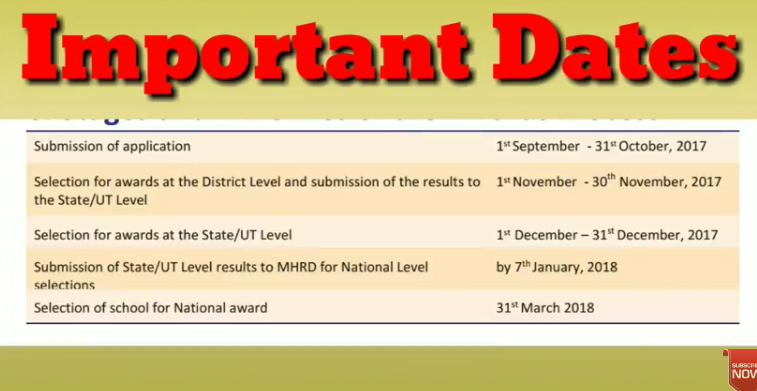 • Schools selected for District Level Awards with overall rating not less than Four Star will be considered for the State/UT Level Awards. In case the number of Schools in a district having Five Star Rating is more, all the schools having overall Five Star Rating will be considered for State/UT Level Awards. • These schools will be screened by a State/UT Level Committee headed by the State Education Secretary or her/his nominee and comprising of Director (Education), Director (Health), two eminent school heads (selected by the State Education Secretary), Chief Engineer (Water Supply & PHD), Director (Panchayat Raj), Director (Urban Local Bodies), representatives of Civil Society Organiza ons asmembers. • Twenty Elementary and twenty Secondary schools having themaximum score and rating not less than Four Star fromurban&rural areas (5 fromurban and 15 fromrural ) will be selected for State/UT LevelAwards. • The State/UT Level Committee may get a physical verification of the selected schools done by a team consisting of school teachers and students in the district. The verification would be done using a check list and taking photographs. • A maximum of 40 schools selected at State/UT level from each State/UT will be awarded with a Certificate of Recognition. • The State may also decide to confer these schools with additional grants/funds for incentivizing them. • A maximum of twenty entries each at Elementary and Secondary level from each State/UT would be considered for the National Level Award. • Amaximum of 40 schools selected for State/UT Level Awards with rating of five stars fromeach State/UT will be considered forNational LevelAwards. • 3 best performing States will be recognized and awarded with a Certificate of Recognition based on the scores secured by their nominated schools qualified forNa onal level awards. • 100%physical verification of the nominated schools will be done using a check list and by taking photographs. • A National level Committee headed by the Secretary (School Education & Literacy) and comprising of Additional Secretary (School Education), Joint Secretary (Ministry of DrinkingWater and Sanitation), Joint Secretary (School Education), 3 experts in Schools/ Bilateral agencies/Civil Society Organizations (to be nominated by Secretary(School Education&Literacy) asmembers will decide the final awardees. Sanitation and hygiene along with a Certificate of Recognition. • In addi on, Certificates of Recognition would be awarded to best participating Districts (Total 10) that will be judged on the basis of the percentage of schools participating in the National level awards. • The Expenditure for theNational LevelAwards will be borne under SSA/RMSA programmes.